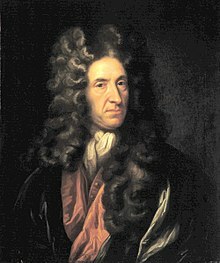 Daniel Defoe (13 September 1660 – 24 April 1731) was a trader, writer, and journalist from England. His best known work is the novel Robinson Crusoe. In some languages, it is the number 2 bestseller, after the Bible. ↑ "Who is Daniel Defoe? Everything You Need to Know". Retrieved 2018-01-25. This page was last changed on 28 February 2018, at 07:14.